For all parents, introducing their babies to the world of solid food is nerve wracking. What if my child has an allergy? What if she chokes? What if he refuses everything I make? Should I use jars? Does it have to be organic? Where on earth do I start? For parents of premature babies it is perhaps even more daunting. The offical UK guidelines for introducing solids are to start at 6 months. However there are no guidelines specifically for premature babies. 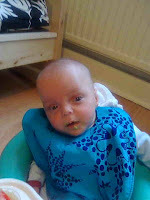 My Health Visitor expected me to start at 6 months corrected (so nine months old), the Special Care outreach worker said anywhere between 3 to 4 months after Joseph's estimated due date. However the Bliss Guidelines said anything between 4 months and 6 months from the baby's actual date of birth. Confused? I was. I knew from my reading, start too early, and the baby is at higher risk of stomach problems. Start too late, and the baby may not take to weaning and you've missed "window of opportunity". I asked other parents, I did research and decided to start Joseph at 23 weeks. 24 weeks is clinically considered 6 months old. I thought if I started at 23 weeks and it all went wrong, we could just pack the weaning spoons away and start again at a later date. Now what to do? Baby rice? This is the traditional weaning food in the UK. I mixed a bit with Joseph's formula (which I have never bonded with) and it tasted disgusting. I couldn't do it to him. So I carefully mashed up some avocado. He adored it, he seemed to know pretty much what to do from the beginning. I was stunned as his little mouth opened to take each new mouthful. The next day he had mango. Progressively we worked through a number of different vegetables and fruits. He didn't reject anything. I have found introducing Joseph to food to be a joy, after my initial terror. We have had some lovely moments, eating together at breakfast is my favourite time of the day. We sit on the floor, him in his bumbo, share his tray, and eat together, planning our day. Lunch time is lovely too, we often have soup, and eat together. I'm trying to introduce finger foods at the moment, and occasionally we look at each other and laugh as we are covered in bits of mango or papaya! And we've had some suprises. There is a rather hideous Annabel Karmel recipe for salmon cooked in orange juice topped with cheddar cheese. I cooked it for Joseph, tried it myself, and then made it for my husband and I, it was lovely! Joseph adores food, and kicks his little legs with delight every time I bring something out to him. Often he stops eating and just grins, mouth and face covered in food. I have lots of lovely foody grin pics. I never really understood why some people used baby rice so I never did! (Used "real" rice when I got the urge.) I really like that you're giving him "real" food from the beginning too, Sophie certainly loved touching and exploring the textures of things she could hold rather than having everything mushed for her! Here from the Bliss message board. Hope you don't mind me popping in! My little girl was also born prematurely. I agree that baby rice is revolting. I tried to give it to J once, she rejected it. Then I tasted it myself and understood why! Joseph is looking lovely. It sounds like he is enjoying the new and exciting world of FOOD! On the juice theme, chicken poached in apple or orange juice is also very nice. I did chicken in apple juice at mum and dad's!